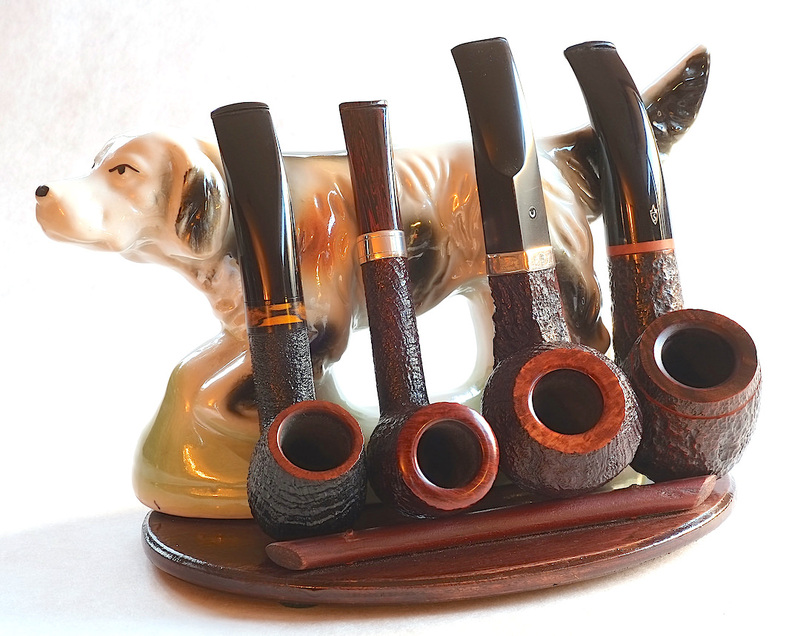 What pipe racks do you have? I think I should do some shopping or requesting. Nothing fancy. A bunch of those circular lazy Susan types with the ugly glass jar. One or two singles and a couple of sixers. I wish the top had open slots instead of holes. If you get in a hurry you can break a stem pulling one out. Same here, thought I think only a couple of them has pipes in it and they sit inside the hutch of an old secretary desk. 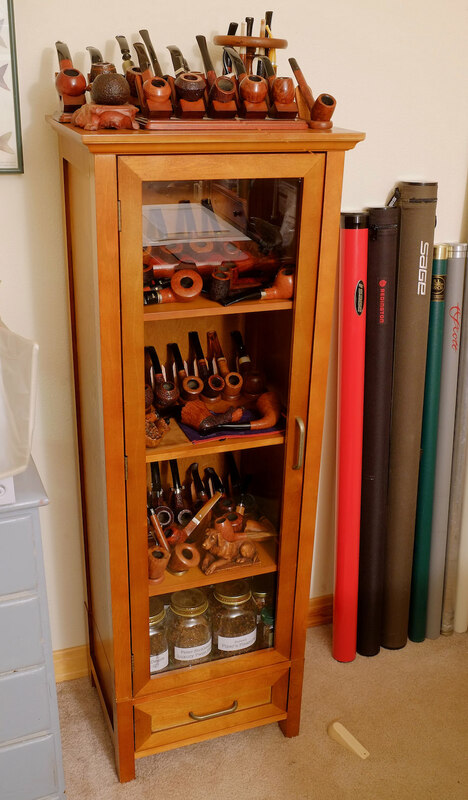 Most of my pipes are kept in the drawers. None...nope not one. My pipes reside in the converted cabinet on shelves. I make my own. I bought one on eBay and used it as a template to make more. I just use pine and stain it. 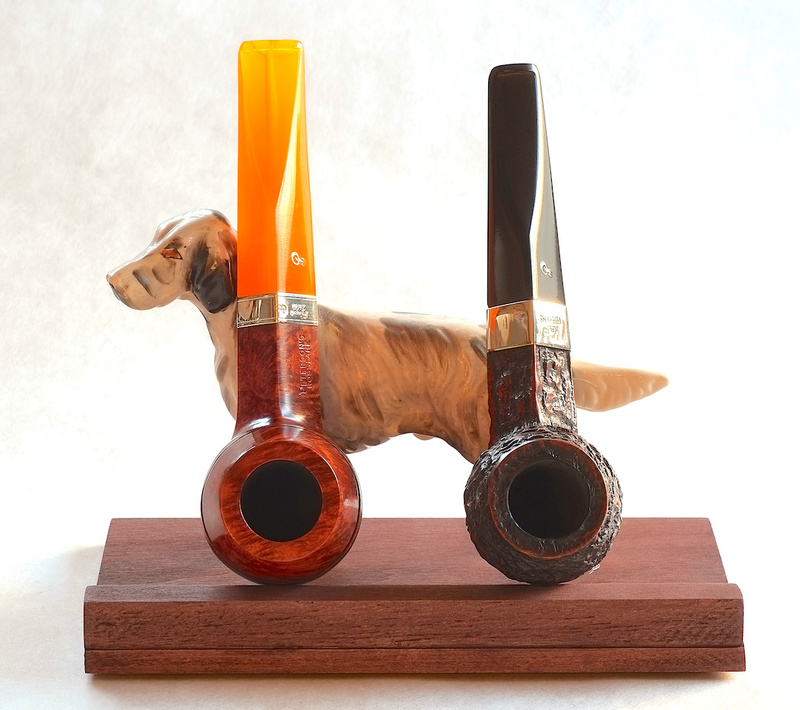 They end up running about $10 a piece holding either 7 or 10 pipes. I’ve got a mess of ‘em. Singles up to Seven Day Set racks. Most of them are old ones found in antique shops or on eBay. Depending on how many pipes you have or expect to have, a cabinet really helps to clean things up. The cabinet was my wife's idea, but once she gave it to me (another Christmas present), I grew to really like it. I recognize one pipe in this cabinet. Bottom shelf, second from the left, looks like the dog is sniffing it. A beautiful Don Carlos I got from a guy in Virginia New Mexico Texas. Most of my pipes reside in a curio cabinet with a variety of racks. My small collection of high end pipes sit on a really cool Neal Yarm magnet stand on the top shelf. The next two shelves have two 10 pipe Decatur stands. One with holes and one I cut the holes into notches. I really dislike the stands with holes. It's a pain to get pipes in and out of then and some bents won't fit in them at all. I need to fix the other one.....some day. I do have a variety of single stands as well. One handmade from a CPSer that I don't think is active anymore that I really like, a multitude of plastic folding stands, a couple Anthony Harris single pedestal magnet stands that are pretty cool, and a cool single stand in the shape of a fish. You've seen these before in another thread. I too hate the racks with stem holes but find some are too upright for use after modification. I made the two tier lazy Susan rack on the right and should make another maybe. I also made the clay holder from some pallet wood. I made these with a drill, dremel tool, and sandpaper. The first two are mahogany and the last is poplar. Nicest racks I've ever seen were on a Sephardic (Spanish) Jewish lady I knew, not far from here. Really something to behold. Goose55 wrote: Nicest racks I've ever seen were on a Sephardic (Spanish) Jewish lady I knew, not far from here. Really something to behold. 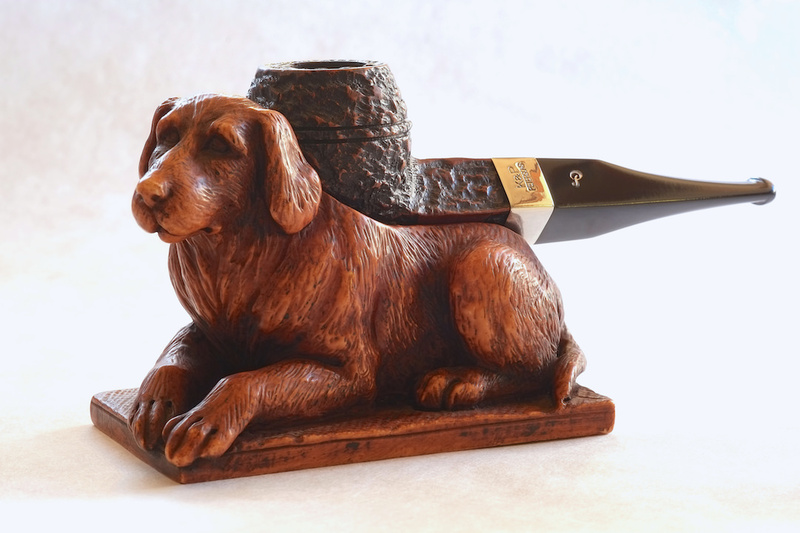 I don't own a pipe rack/stand. Me too. He pluralized a word that should not have been pluralized. 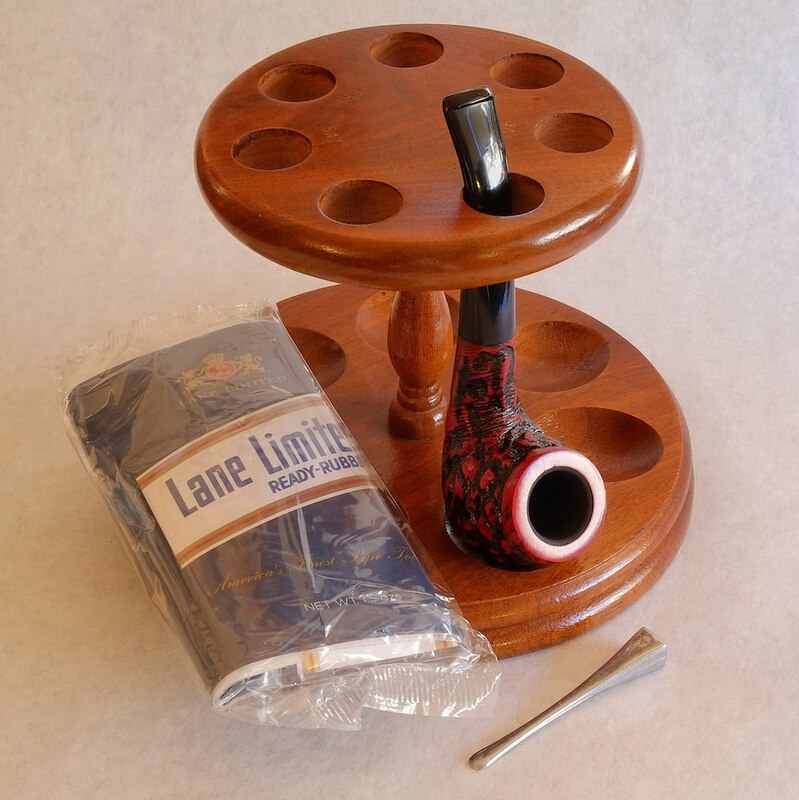 For my birthday, my wife bought me a nice 6-pipe rack from SmokingPipes. I think that she was of the idea that it would somehow limit my PAD - like once it's full, that's it. It didn't take long for my collection to surpass what this rack could hold. ... and sleeping on the couch really isn't all that bad. Maybe she had four mammaries?